Helping to conduct a Design Thinking exercise at LiveSafe. We ran team-wide exercises with all facets of the company to inspire everyone to see through the user experience lens. Having the right process affects every facet design work. Does the client know what problem they are solving? Have you, as the designer, done enough research to adequately approach creative solutions? After having read Thoughtbot's design sprint material, I switched up my process a bit to include client sketching from the get-go. Feel free to read my most recent blog on "Common design process mistakes" (under Mobility Labs). 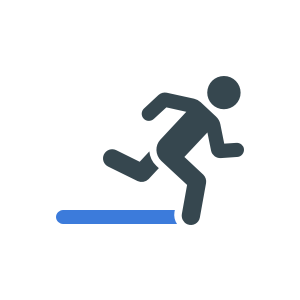 Whether it is a 5-day sprint, or the product has been deployed and you are iterating upon it, the correct structure for a process saves time and money. Moreover, it saves the design team from frustrating unnecessary back-and-forth. Read through the phases below to understand how to optimize design on your team. The Discovery process is vital to building a product that addresses a real problem with an audience that is ready to for it. This phase means brainstorming new ideas and building out other ideas that have been tossed around for awhile. All relevant stakeholders should attend the Sketching meeting to hash out ideas generated in the Discovery phase. The sketching session should not exceed 7 people, but usually includes folks from all sectors of the business i.e. Marketing, Customer service, tech, and sales. Ideally, all stakeholders are available to meet throughout the milestones of the sprint, but this meeting is the most imperative to have all members. For the most part, after the sketching session people understand and agree of the representation of the critical path. During the day of sketching, convergence around that path is obtained. The iterations of sketching will result in a unified vision, which is then digitally represented in a clickable prototype (using Sketch and InVision). After the low-fidelity, clickable prototype is designed, it is time to write usability scripts and test! Depending on the need, the test might be strictly usability focused. Usability tests aim to understand how users interpret and use an interface to complete a task. Once design improvements based on learnings from user testing have been completed, translating requirements to being development is the next step. This phase is not considered "hand-off," because communication with the technology team (or lead) has been consistent throughout. The National Head Start Association is committed to giving every vulnerable child an opportunity to succeed. Under my current organization, Mobility Labs, I worked hand-in-hand with their internal team to improve upon an existing web application called Go Smart. Go Smart’s mission is to get more young kids moving. 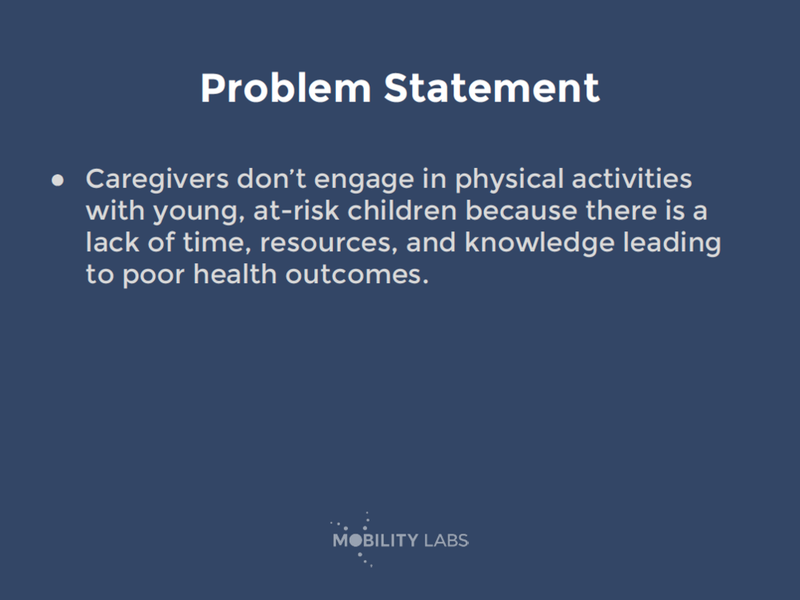 The application provides valuable physical activity content to in-home caregivers. Our kick-off meeting with NHSA focused on increasing engagement of the current platform and surfacing valuable content to current users. Overall, the project goal could be summarized as: increase user engagement. With Go Smart the development of the problem statement was fairly straightforward, because the product itself already existed. When creating a problem statement for a new product, it is important to collect data to understand whether or not it is a true need in the market. The "5 whys" exercise is an activity I white-board with clients if they're problem statement needs refining. This exercise enables you to understand the problem more deeply and leads to a crystallized problem statement. During out kickoff, persona generation and designating a primary enabled us to focus on their needs more specifically. During our kick-off we went through a map of a childcare giver finding an activity to use through Go Smart. Are we solving the right problem for childcare providers? After our kick-off, I designed this survey to understand the target audience (and their pain-points) more deeply. We learned that most teachers are taking photos in the classroom to send to parents, which ended up being a key learning for engagement down the road. Click the image to see the full survey. Are we solving the right problem for administrators? Click the image to see the full survey. After we collected over 100 responses from our target audience, I conducted a sketching session with the client. As a group, we sketched functionality that we thought would be used: Scheduling, filtering, sharing, and publishing. After we completed a few rounds of sketching for each (important) feature, we came to "design convergence." Convergence happens when everyone's sketches extract the best ideas of the group, they represent the best foot forward. These sketches are then used to compose the low-fidelity wireframes that I design in Sketch. Once the sketches are aggregated, I design clickable prototypes to user test. The completed flow focused on a new landing page, a better filtering system and new ways to share activity snapshots. We learned from the survey that the parent/caregiver rapport might be the most important part of the caregivers job (beyond being a competent caregiver). The NHSA network is national and so we had respondents from all over the country to pull from for testing. I used quicktime to record the sessions and instructed the user to share his/her screen while I ask questions from my script. Once the low-fidelity wireframes were tested and adjusted based on user feedback and friction, I designed the high-fidelity mocks. Using previous iterations' visual style, I created the graphics below to match and enhance the workflow. The key to engagement for this application is parent involvement. I designed the activity flow to communicate with board subscribers. This new functionality would notify parents when new content (photos, notes) has been published to the board. Parents can then see new photos of their child engaging in motor activity. Moreover, they can view the activity and complete it with their child for continuity. After the high-fidelity clickable prototype is complete, I export assets for development. Assets are managed in a communal folder and attached to individual tickets in waffle.io for easy consumption. After launch we will track their analytics relative to what existed before the enhancements to understand our progress.